I promise in my absence, I have been stamping. Unfortunately with our new computer came several new programs that I've had difficulty navigating...especially for photo's. I'm also still struggling with a few issues such as watermarking the image with the Stampin' Up! copyright. However I do have a disclaimer on my blog, so I hope this will suffice for the time being. Moving on, the above card I recently created for a friend who's celebrating a birthday. Although she hasn't seen it yet, I feel safe posting it for your enjoyment now as she doesn't check my blog. I've used a lovely DSP from our new Spring Mini catalogue. This DSP called Parisian Breeze is a specialty paper that is extra thick and textured. I love it! * Baja Breeze & Whisper White Cardstock. Parisian Breeze Specialty DSP. * Baja Breeze Stripped Grosgrain, 1/3/8" Circle Punch, Scallop Circle Punch, Mini Glue Dots & Stampin' Dimensionals. 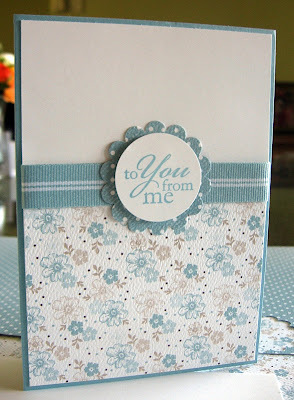 Good to see you creating Nerine, its a beautiful, soft card. Computers really are this days time wasters and I don't enjoy swapping because things change so quickly. I use googles Picassa for all my photo management, you can backup your photos and if you ever need to get a new computer you can just reinstall them. Hope it sorts out for you soon. Lovely card Nerine. I too love the specialty papers.